Marantz PM6006 (2016) review | What Hi-Fi? Hi-fi kit isn’t like festival tickets, train fares or council tax; if the price goes up there is usually a good reason for it. For as long as we can remember, Marantz’s budget stereo amplifiers have entered the ether around the £300 mark, so we can’t help but look at the £400 Marantz PM6006 – part of the brand’s new 6006 Series, alongside the CD6006 CD player – through quizzical eyes. The PM6006 appears to be a modest heir to the five-star PM6005, getting a second optical input, new ‘high-performance’ feet to further reduce unwanted vibrations, and upgraded internals, including an improved power supply and extra metal housing to further limit the impact of the digital stage on the analogue signal. Of course, that means little if it doesn’t result in improved sound quality. The good news is that the same smooth, suave temperament and even-tempered balance manifests itself from the first few guitar twangs of Santana’s Song of the Wind. But switching between the PM6006 and its predecessor, we notice the 6006’s presentation is notably cleaner and clearer – more solid too particularly through the midrange. The bluesy instrumentals have more assurance; the epic electric guitar solo ripping through the arrangement has more impassion and soaring pathos, while the Marantz is determined to pull cymbals, bass guitar and drums into your attention span. We listen to La Fuente del Ritmo from the band’s Caravanserai album and the PM6006 shows off its dynamic handiwork. There’s variation to the opening piano notes, which go for warmth over outright crispness (as is often the Marantz way), and it puts its foot down on all the right accents. The composition is one of the more rhythmically intricate in our collection, but the Marantz takes the jazz/salsa fusion in its stride, making sense of frenetic guitar lines and conga drum patterns as they join the mix, and capturing the track’s musical nature – only starting to sound muddled when the volume is pushed. We let it come up for breath with a sparser recording, The National’s Pink Rabbits, and the Marantz lays down the baritone vocals with pleasing insight. Emotional baggage is conveyed, with the focus and clarity to break free of piano and drum accompaniment without sounding astray. A 24-bit/96kHz recording of Willie Nelson’s Dark as a Dungeon cover (via coaxial) reveals the PM6006’s sonic potential, and its ability to get under textures. Here the banjo and his country twang are captured by the recording’s spaciousness, the Marantz painting a serene and calm canvas that befits the song. The only slight predicament the PM6006 faces is that the price puts it in more direct competition with the Award-winning Cambridge CXA60 (£500). The CXA60 takes punch, solidity and detail levels far enough to justify the extra outlay. 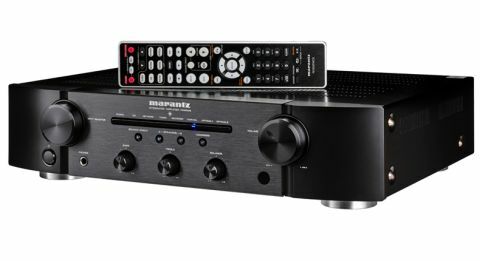 The transition from Marantz’s PM6004 amplifier to the PM6005 saw the addition of a DAC and digital connections – an upgrade that hurtled it into the digital age, thus giving it a good shout of topping the modern-day consumer’s shopping list. No such radical step has been taken with the PM6006. Matching its predecessor’s legacy connections – four line-level inputs, a phono stage, 6.3mm headphone port and tape loop for recording – it still has the same 24-bit/192kHz support and retains its predecessor’s single coaxial input. The second optical input certainly makes it more versatile for someone with a combined two-channel hi-fi and home cinema system looking to connect a hi-fi component – Marantz’s CD6006 CD player or N6005 streamer, for example – as well as a telly. But it isn’t the extra digital input we’d really like it to have. With the PM6005, we expressed our wish for a USB input for a more straightforward connection to a laptop, and that wish remains unfulfilled. With the right adapter, you can hook up a laptop via either of the amp’s optical inputs, but it’s not ideal. That means ‘Optical 2’ now features on the inputs that line the front panel, but otherwise nothing of particular note has changed in appearance. With the ‘Marantz look’ seemingly set in stone, the PM6006’s looks a lot like its predecessors, in fact going right back to the PM6001, in fact. It’s still a smart-albeit-busy, solidly built aluminium chassis, in silver or black, with a dial-heavy front for input, volume and tone controls. More evolution than revolution, the Marantz PM6006 exists as another solid go-to for someone nailing down their first hi-fi system. It has a clearly improved sound over the impressive PM6005 and a marginally more appealing set of digital connections. Right now, it stands as a stepping stone between the Award-winning Onkyo A-9010 and Cambridge amplifiers – and rightly deserves to be in such formidable company. The only real disappointment is that we repeat this line from our PM6005 review: “we’d love to see Marantz fully embrace all digital sources with its next iteration”.